This grantee was part of the Center’s Shared Services Learning Community, under the umbrella of the Minnesota System Wide initiative. It also was part of the Center’s Small Grant Program. 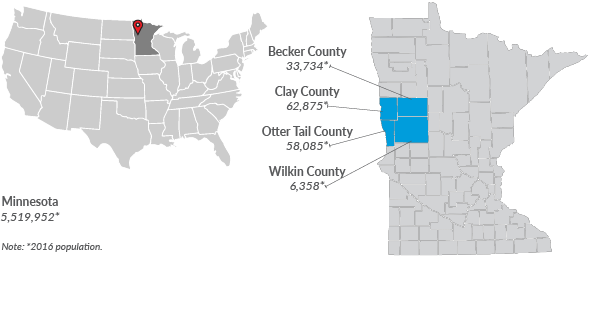 PartnerSHIP 4 Health is a new community health board that governs the four local health departments serving Becker, Clay, Otter Tail and Wilkin Counties. Since its establishment, PartnerSHIP 4 Health has undertaken a four-county community health improvement planning process, developed sequential strategic plans and implemented a branding strategy. Four programs are now shared among all departments, with staffing models, policies and procedures designed by the involved staff. It is anticipated that more programs will be shared in the future as opportunities arise with staff turnover and new grants. For the complete story, read the Center’s 2018 CJS Case Report about the site. To learn more about the public health system and cross-jurisdictional sharing in Minnesota, and to find examples of other CJS arrangements there, visit the Center’s state page about Minnesota. Center co-directors and learning community members discuss cross-jurisdictional sharing at the APHA annual meeting. The Center hosted a webinar about the quality improvement and patient safety program at Michigan Community Dental Clinics. Site visitors and team members in Carson City/Douglas County Nevada. The Center and members of the learning community will present at APHA. WEBINAR about Michigan Community Dental Clinics. SLIDES from the above webinar. FOLLOW-UP WEBINAR on quality improvement efforts. The Center co-directors will conduct a learning session on using the Roadmap. The Northern Michigan CJS Demonstration site presented a webinar May 28, 2014, that focused on shared dental services in their state. John Hoornbeek (standing on right), Associate Professor at Kent State University, is the project lead for the Ohio site. A list of common themes is now available on the Center’s website. John Hoornbeek, team lead of the Northeast Ohio project. Pictured from left to right: Nicki Aaker, Pat Libbey, Gianfranco Pezzino, and Julie Sullivan. Smartsheet is a web-based project management software with the look and feel of a spreadsheet. Two of the Shared Services Learning Community teams recently launched new websites to enhance their communications efforts. This resource provides an overview of steps for meeting planners to facilitate effective meetings. This map from the Northern Michigan Public Health Alliance shows the health department districts participating in the alliance. This table details public health sharing arrangements in the San Luis Valley. This is an example of a human resources flow chart for resolving issues in a CJS partnership. This document describes the shared mission, vision, and values of the San Luis Valley (CO) Public Health Partnership. This Excel spreadsheet for employee evaluation is used by the San Luis Valley Public Health Partnership in Colorado. Members of the Genesee and Orleans Counties, New York team.